Love simple, yet tasty “casseroles” that can be pulled from the freezer. 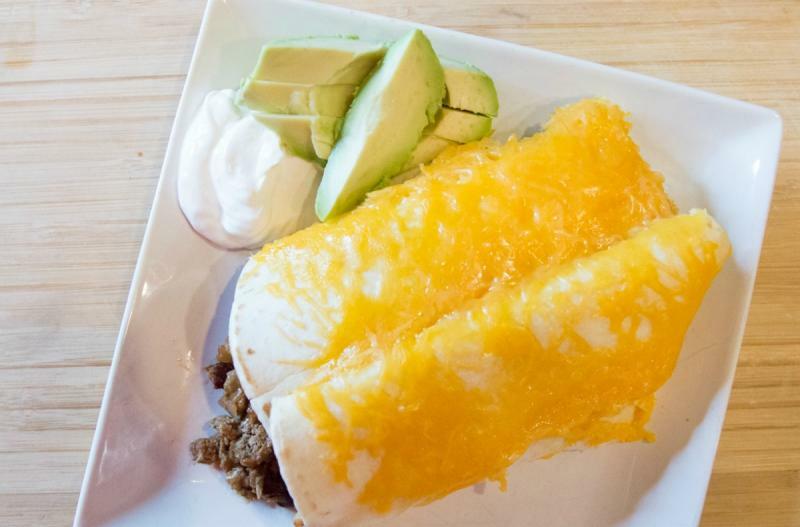 We’re going to make up a lovely filling for these beef burritos and then wrap it all up in flour tortillas, then top with cheese and bake until warmed through and cheese has melted. 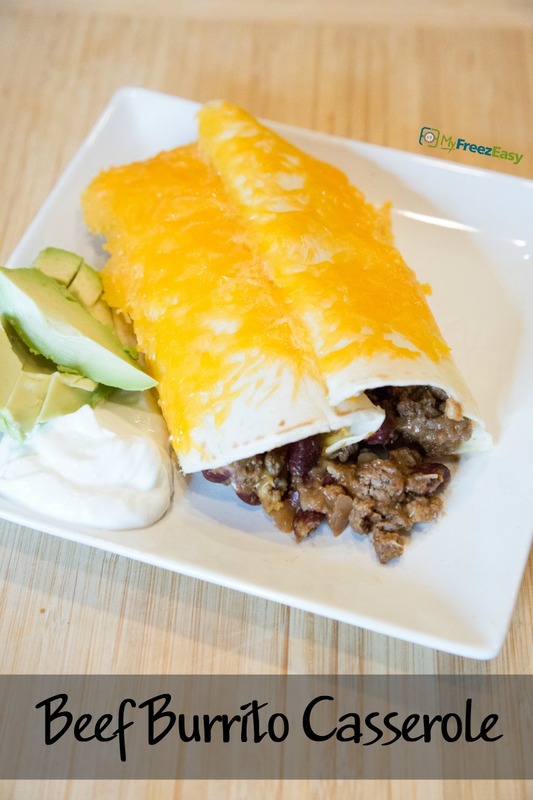 These beef burritos will be a hit for your family on a busy weeknight, or for guests in town for a visit. Enjoy! Preheat the oven to 350 F. Lightly grease a 9x13-inch baking dish with non-stick cooking spray. Open the can of chili beans. Brown the ground beef with the minced onion and garlic powder. Drain if necessary. Stir in the beans, salsa, cumin and shredded Monterrey Jack cheese. Spoon the beef and beans mixture into the tortillas, then roll them up and place seam side down in the prepared baking dish. Repeat until all the meat is used up and burritos are cozy in the baking dish. Sprinkle the shredded cheddar cheese on top and bake in the preheated oven for 20 minutes, or until cheese on top has melted. Add sliced avocados and/or sour cream as garnish. Serve Beef Burrito Casserole with veggies. Open 2 cans of chili beans. Brown 2 lbs. ground beef with 2 Tbsp minced onion and 2 tsp garlic powder. Drain if necessary. Stir in the beans, 2 cups salsa, 2 tsp cumin and 2 cups shredded Monterrey Jack cheese. Cover with foil or lid, add label and freeze. Put tray in the freezer and freeze up to 6 months in fridge freezer or 12 months in a deep freezer. Thaw in the fridge overnight, or a warm shallow dish of water for about 20 minutes, before transferring to the oven and baking as directed. Unfortunately, there is not a great dairy-free option for this meal. Recipe is gluten-free when made with gluten-free tortillas or corn tortillas. Thaw completely and bake at 350 F for 25 minutes. Serve with avocado slices and/or sour cream garnish with side of veggies.